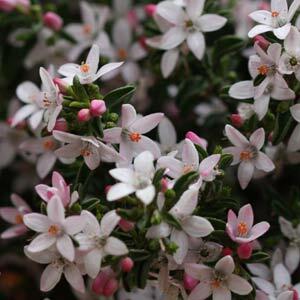 Eriostemon are a flowering shrub that grow widely in areas of eastern Australia. Grown mainly for the flowers. Until recently a number of species were named Eriostemon, however many have been reclassified as Philotheca and today only two species remain in the genus. Found in coastal areas of southern Queensland to New South Wales, these small shrubs with waxy flowers are wonderful garden plants under the right conditions. They grow well in light shade and do require a moist soil. They do not like dry summer conditions, nor do they like waterlogged soils. Well drained soil with some moisture. Fertilize using a slow release low phosphate fertilizer. As the old name is still used we have included them in this index. CARAWAH NURSERY 15 Falls Road Hoddles Creek Victoria 3139 phone: 59674244 fax: 59674239 Wholesale propagators specialising in Australian Native Tubestock. Our list comprises of hard to grow and pictorial lines. Monthly & Annual Forward Order catalogue. Accredited to all States.